EARTH DAY 2011: This isn’t what I had planned to write for Earth Day. But it’s the most important thing I can write today. I write these words with a single, challenging purpose: I need you to care deeply about something. I need you to care about something that wasn’t supposed to be possible. I need you to care so deeply that you choose to help. And to make things even more challenging, what I need you to care about is a place you’ve never heard of and are very unlikely to see in your lifetime, a place that’s such an infinitesimally tiny speck lying quite literally in the middle of the South Atlantic Ocean, it appears on few maps (and even befuddles Google maps). And unless you’re one of the fewer than 300 people that call Tristan da Cunha home, it will take you at best 5-7 days to get to this airstrip-lacking place even if you dash out the door before finishing this paragraph. Tristan da Cunha is, quite literally, the most remote inhabited island in the world. A sign on the island boasts this factoid, alongside a marker pointing east toward the nearest civilization: 1,511 miles to Cape Town, South Africa. This story is so unlikely as to be almost statistically impossible, right down to my unwitting involvement smack in the middle of it. 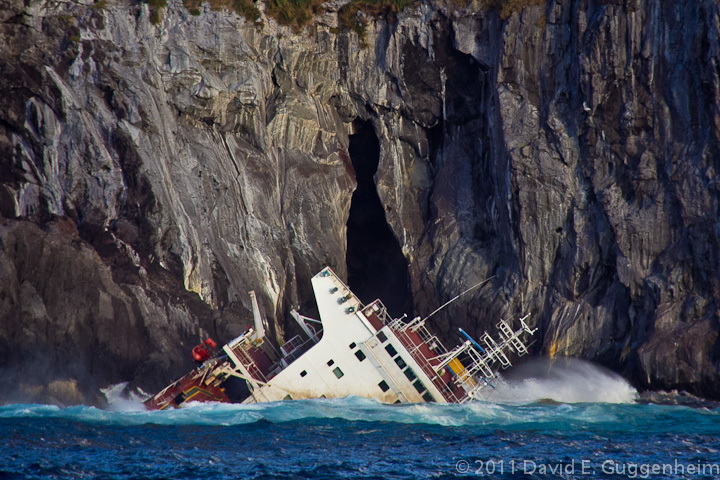 On March 16, 2011, a 700-foot Greek freighter named Oliva, transporting soya beans from Brazil to China — inexplicably far off course — slammed into the rocks of the most remote inhabited archipelago in the world, at the northwestern corner of Nightingale Island, a small, uninhabited neighboring island of Tristan da Cunha, roughly 12 miles away. By the most unlikely of coincidences, the Silversea expedition vessel, Prince Albert II, where I happened to be serving as a guest lecturer, was a day ahead of schedule, headed directly for Tristan da Cunha as its next destination, and the closest ship in the area. 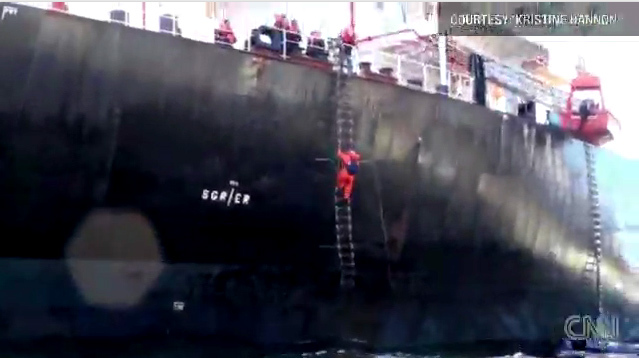 The Prince Albert II was asked to assist in rescuing the crew of the Oliva. Also dramatically improbable was the fact that because the Prince Albert II is an expedition ship, it had aboard a fleet of Zodiac inflatable boats — ideal for rescue operations — and an expedition team specially trained and experienced at using them in the unpredictable and unforgiving seas of the Antarctic and Arctic. After arriving on scene the next day, the Prince Albert II’s expedition team successfully rescued the 12 crew members still aboard the Oliva. Unfortunately, this is only the beginning of the story. The expedition team returned to the Prince Albert II to cheers from the passengers, but as they approached the afternoon sun revealed that their bodies and boats were dripping in a dark brown goo that confirmed our worst fears: Oliva was leaking its 300,000 gallon load of heavy marine oil. Everything the team wore — and the Zodiacs themselves — would need to be destroyed. Despite the crew’s attempts, nothing could pry the grip and stink of the thick fuel from the gear. The team’s lungs, eyes and skin stung from the soupy blackened waves that had inundated their small inflatable boats. 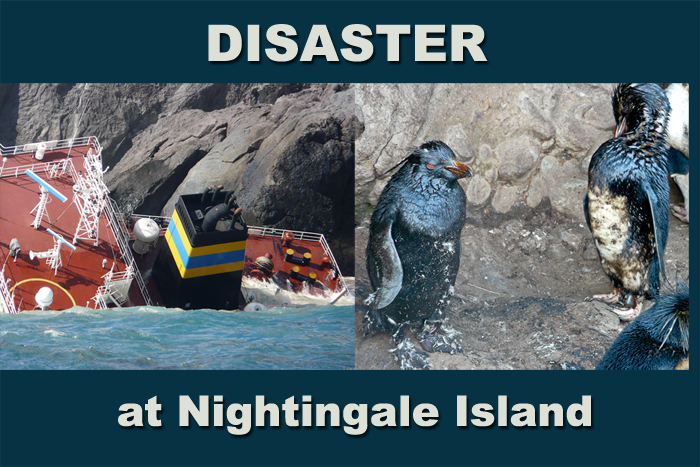 As we watched immense, foamy brown breakers crash against Nightingale’s steep walls and an ever-growing trail of oil surrounding the island and trailing out to sea, it was profoundly clear that you don’t need an oil supertanker or even a small oil tanker to create a devastating oil spill. The ship’s own fuel supply will do quite nicely, especially if delivered strategically to the doorstep of a place as environmentally vulnerable as Nightingale Island. And hence, the next improbabilities in what would become a perfect storm of environmental nightmares: Tristan da Cunha and neighboring Nightingale and Inaccessible Islands aren’t just barren volcanic protrusions poking through the middle of the South Atlantic. For thousands of years, these tiny islands, protected by their remoteness from humankind, have served as a place of safekeeping, where Mother Nature has quietly harbored the second largest population of seabirds in the world. And this precious ark of life is precisely where Oliva unleashed its payload of heavy petroleum. Prince Albert II slowly sailed past the dramatic backdrop of towering Inaccessible Island, whose imposing cliffs rise nearly vertically from the cold blue depths. The horizon tugged at a brilliant deep-orange sun until it hung low in the sky, heralding a mesmerizing spectacle that left us speechless. Thousands upon thousands of shearwaters, albatross, prions and other seabirds poured endlessly into the sunset, filling the sky above the cold, rich waters around Inaccessible. Nowhere in the world have I ever seen more birds together in flight. 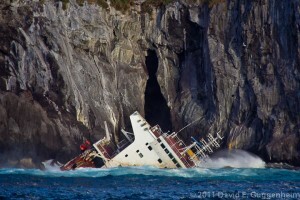 Less than 10 hours later after the Oliva‘s crew was rescued, the enormous swell broke Oliva‘s back. The ship broke in two, and the stern section where the crew had been, rolled onto its side and under the roiling waves pummeling the jagged rocks and steep cliffs of Nightingale. Had the Prince Albert II not been a day ahead of schedule, there surely would have been loss of life. We slowly sailed past to see the two halves of the ship pried far apart from one another by the relentless swell, thick black oil visible in the water around us. What toll was this taking on the wildlife, we thought? The Tristan island group is the stuff that bird lovers wildest dreams are made of. The skies are constantly streaked by broad-billed prions, Atlantic yellow-nosed albatross, white-bellied storm petrels and sooty albatross. 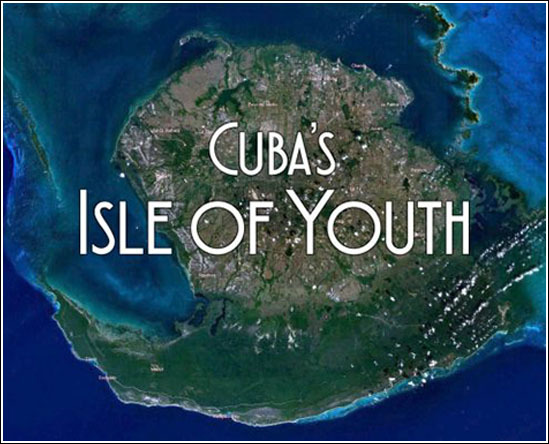 The islands are also home to the largest concentration of Great Shearwaters in the world. Of a world population of 5 million, 4 million are concentrated on Nightingale and Inaccessible. Only 10,000 nesting pairs of the spectacled petrel remain, all of which live on Inaccessible Island. Only 50 pairs of the endangered Tristan bunting exist, all on Nightingale Island. Expedition team ornithologist, Will Wagstaff, had already snapped a chilling photo of a yellow-nosed albatross dotted with oil. But it was the flightless birds — the penguins — that worried us the most. We knew there was simply no way for them to avoid the oil. The archipelago is home to half of the world’s population of the Northern Rockhopper penguin, an endangered species that has declined nearly 90 percent since the 1950s. The Northern Rockhopper sports a playful yellow headdress that swoops past its deep red eyes and dangles over the edges of each side of its head, obtaining a spiked hair look that hair dye and styling gel can only approximate for human punk rockers. The situation looked grim for the penguins. But we learned that it wasn’t just that Oliva was hemorrhaging its fuel at one of the worst possible places on the planet. In yet another unlikely coincidence of this disaster, Will informed us that it was happening at the worst possible moment in time. Penguins spend most of their life at sea, coming ashore only to nest and molt. This was molting season, and tens of thousands of penguins were ashore as their old feathers molted and their new features replaced them. While they molt, penguins can’t enter the water without the thermal protection of their feathers lest they become hypothermic. So they stand around and wait, unable to feed, eager to get back into the water, all the while becoming weaker and weaker. We feared that the oil would envelop the penguins in their most vulnerable condition. After a two-day wait until seas were calm enough to reach shore in a Zodiac, I landed at Tristan da Cunha and found Trevor Glass, director of the Tristan de Cunha Department of Conservation, at his home. He was understandably shocked but pleasantly surprised to find an American from Washington, DC on his doorstep beneath a volcano in the middle of the South Atlantic. I was welcomed in, treated to a beer and warm Tristanian hospitality, but the bad news came quickly: Oil had completely surrounded Nightingale Island and was on its way to Inaccessible Island. He had just returned from Nightingale, supervising his small team that he endearing refers to as “the boys” who were there dealing as best they could with the situation. His team reported penguins completely covered in oil, along with sub-Antarctic fur seals. Some had died. 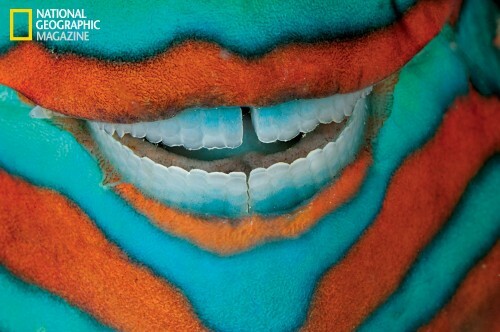 The economic lifeblood of Tristan da Cunha is crayfish (lobster), its primary export. Trevor estimated that 75 tons crayfish (lobster) per year would be lost from Nightingale Island alone. His team, specially-trained for rope access to the steep slopes of the island, were in the process of implementing their emergency plan to deal with the invasion of rats from a shipwreck onto the island. This involves laying of rat poison and traps throughout the island. Nightingale is a rat-free island and rats can cause tremendous harm to nesting birds. Trevor said that they were now concerned about nearby Inaccessible Island, whose name befits its ruggedness, remoteness and lack of humans. It’s a World Heritage Site, and Trevor had difficulty speaking when he pondered the possibility of oil impacting the island. By the next day, oil would surround Inaccessible Island, too. In the time I spent with Trevor, it became clear that out here in the middle of the South Atlantic — nearly a week’s boat ride from the nearest civilization — the situation was extremely dire. Some would say it was hopeless. The same remoteness that has for centuries protected the incredible wildlife of this group of islands was now working menacingly against it. How could we possibly help? At his home, on a kitchen counter, I scribbled into my notebook as we made of list of supplies needed by his team. Before our imminent departure for Cape Town that afternoon, I returned to the ship, worked with the crew of the Prince Albert II to gather what we could in less than an hour before we had to depart for Cape Town. We were able to provide gum boots and parkas for his team, along with a few pairs of gloves. After we departed, members of the community on Tristan da Cunha pulled together and dropped everything to help the penguins. They converted the community swimming pool and a storage shed into rehabilitation centers, and did what they could as they relocated nearly 4,000 oiled penguins from Nightingale and Inaccessible Islands to Tristan da Cunha for rehabilitation, a feat made exceedingly difficult by gale-force winds and the area’s notorious and deadly high swell. 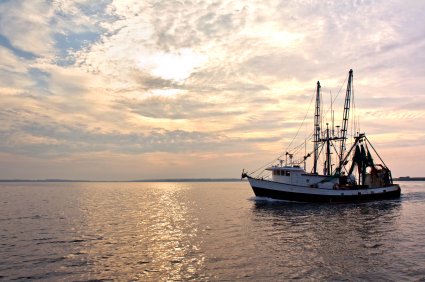 They sent fishermen out into the treacherous seas to catch food for the hungry birds. What they couldn’t catch they found in their freezers, donating their personal supplies of frozen fish meant to feed their families. Aboard ship, we began a barrage of emails seeking help. 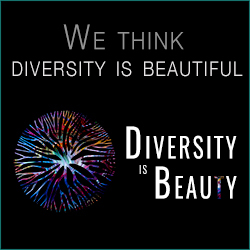 Groups around the world responded. SANCCOB (The Southern African Foundation for the Conservation of Coastal Birds) based in Cape Town, quickly mobilized. They had led in the rehabilitation of nearly 40,000 African penguins — the largest wildlife rescue and rehabilitation effort in history — a decade ago after the Treasure sunk off the South African coast. The Royal Society for the Protection of Birds (RSPB), which already had a long history of working on Tristan da Cunha, was engaged. 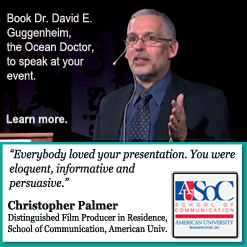 My media contacts stateside were apologetic. As much as they wanted to cover the story, the earthquake, tsunami and nuclear meltdown in Japan, the unrest in Libya, and, of course, the ongoing antics of Charlie Sheen dominated the media cycle like nothing they had ever seen in their careers. Fortunately, some were able to get the story aired. Aboard ship, Public Radio International’s “Living on Earth” interviewed us via satellite phone. And when I returned to Washington, DC, I was interviewed by CNN International. The story even earned a brief mention on the “Colbert Report.” Word was finally spreading and many of you got involved, help spread the word through social media, and opened your hearts and wallets to support the efforts on the front lines. In the two weeks since, additional relief has arrived on the island, including a helicopter to help the teams access the islands more safely than by small boat. Sadly, many penguins have died — more than 2,000 — but the teams are working around the clock to save the rest and have the benefit of better equipment and more specialists at their disposal ? including 28 representatives from SANCCOB. The fate of the many penguins on Nightingale and Inaccessible that teams couldn’t reach won’t be known until August as the penguins have now left the island to feed at sea for the next few months. Meanwhile, work continues on the islands with the tedious job of cleaning the rocky shoreline of oil lest the penguins become oiled again upon their return from sea. 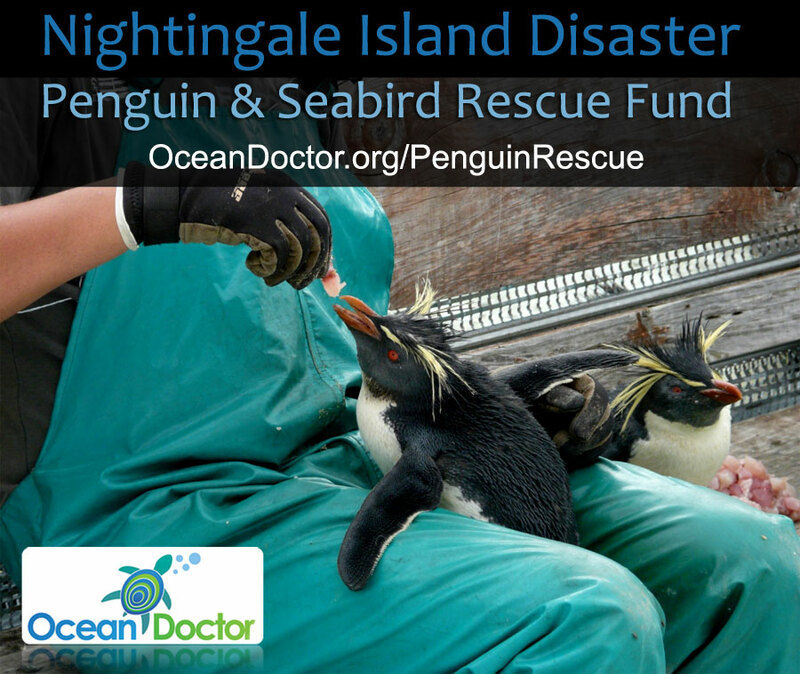 The teams are also working to continue their efforts to ensure that no rats have made it onto Nightingale Island. Teams are also working to develop an assessment plan to thoroughly assess the impact of this disaster. Many of us in the conservation community have been increasingly alarmed at the growing number of similar events — wrecks of bulk carriers — that have been wreaking havoc in environmentally sensitive areas from Alaska to South Africa. It’s becoming apparent that these statistically impossible events aren’t as impossible as we once thought. We’re exploring policies that work to prevent such disasters from occurring again. And we’re also exploring ways to equip resource managers like Trevor, working on very remote islands but environmentally sensitive islands, with the tools and networks they need to deal with such disasters in the future. No, this isn’t what I had planned to write for Earth Day, but in many ways, as tragic as the story of the Nightingale disaster is, it embodies so much of the good we should all feel on Earth Day. It’s about people pulling together around the world to make a difference for our planet. It’s about our love of what’s still wild and untamed out there and our unwavering resolve to protect it. It’s about refusing to believe — however long the odds may at times seem — that protecting and sustaining our environment is hopeless. And it’s about caring about the animals we may never see in the wild, the people in remote communities we may never meet, and even those distant, tiny islands we may never visit. 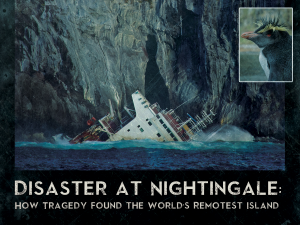 May 12, 2013: The documentary, Disaster at Nightingale: How Tragedy Found the World’s Remotest Island, an Ocean Doctor production, began screening on World Penguin Day 2013 (April 25). 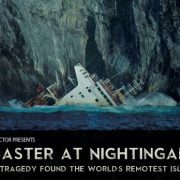 Visit www.DISASTERatNIGHTINGALE.com to see the trailer and for a listing of upcoming screenings.